Nemaco's Product Reference Section for NEMA Submersible Enclosures. Welcome to Nemaco's technical section that provides information for NEMA enclosures. 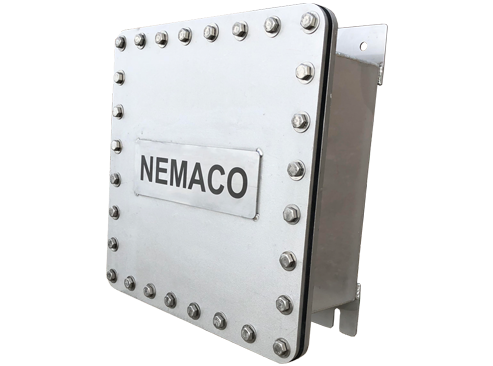 Nemaco has dedicated to NEMA submersible enclosures. This technical reference section is about NEMA submersible enclosures. And you will find other detailed information for the NEMA ratings & definitions. Nemaco will try to provide some samples of submersible offshore enclosures in this product section. Also and whenever possible we will provide internal and external photo images of the submersible offshore enclosures. You can call Nemaco for additional information if needed so you can find the correct enclosure for your offshore project. Most submersible NEMA enclosures would be a stainless metal box used for electrical controls. Stainless submersible offshore enclosures required pickling and passivation for corrosion resistance. NEMA Submersible Enclosures are typically enclosures made from stainless steel materials (sometimes sheet for some applications or heavy plate, cast stainless steel), fiberglass (FRP) or plastic materials for NEMA 6 or possible NEMA 6p. The material is chosen based the application and depth of submersion for NEMA 6 or NEMA 6p. Thin sheetmetal enclosures can be damaged sometimes and not work. In particular, sometimes fiberglass and plastic enclosures might crack or get damaged easily in rough environments with men working. Also, plastic can crack easily from cold temperatures. So, stainless steel material is better material for most submersible offshore enclosures. Also, NEMA submersible enclosures need suitable industrial seals that will not deteriorate in the water, ocean salt water, caustics, oil and the sun depending on the application. Call or send Nemaco if you have any questions about your particular NEMA Submersible Enclosures application.